Where do I use my Gousto voucher code? Select a discount of your choice from NetVoucherCodes. Follow the web link through to the Gousto homepage. Find groceries you wish to buy and add them to your online shopping cart. Once you have finished shopping head over to the checkout. Insert your discount code into the box provided on the right-hand side in the ‘Order Summary’ section. Complete the following steps to finalise your order. "Up to 35% off all boxes in your first month." If you are tired of cooking the same 7 or so recipes week in week out for your family, then turn to Gousto for some inspiration. They have an extensive range of delicious recipes each printed onto easy to follow recipe cards. You simply choose the recipes that you would like to cook and Gousto will deliver the card to your door, along with the ingredients required to create the delicious meal. Each week the choice of recipes will change and there will be a variety of meat dishes, seafood dishes and vegetarian dishes to choose from, so you can introduce the family to new flavours that you are all bound to love. Examples of some of the scrumptious recipes include; snappy Asian fish en papillote, veggie lentil pie, cajun chicken with apricot couscous and tomato and chicken risotto with basil oil. 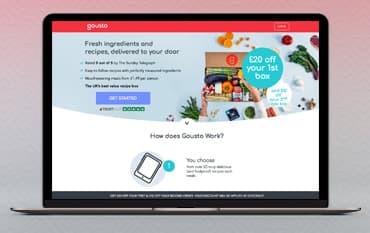 If you have thought about joining Gousto but aren’t quite sure, why not use a Gousto voucher code on your order and get a box for a lot less. Gousto often has a code that will save you 50% off your first box, so you can try Gousto for a fraction of the cost and see if it’s for you. To use the code simply pick the code you would like to redeem, copy the code and paste into the relevant box during the order process. The saving will then be automatically applied and you can enjoy a tasty meal for less. With the Gousto cookbook, you can browse the full collection of yummy recipes online. Each recipe page has a description of the meal and a star rating, based on real customer reviews. A clear list of ingredients is shown along with the nutritional information. The actual recipe is then broken down into easy to follow, step by step instructions, complete with photographs of each step so you will know what the meal is supposed to look like at each stage. The cookbook also has a handy search function, so if your friends or colleagues have been raving about a Gousto recipe you can find it straight away or if you want inspiration for a chicken dish or a dish containing feta cheese, you can just type in your main ingredient and choose from the selection of meal ideas that come up. You can edit or cancel an order until noon, 3 days before your delivery day. To edit an order, log into your Gousto account, and select the ‘Deliveries’ tab at the top of the page – your upcoming boxes will be listed here. Select ‘Edit Box’ on an upcoming order to add or remove recipes, or ‘Cancel Order’ to cancel your box. How many recipes can I choose? You can enjoy up to 4 recipes in each Gousto box (but you’ll need to choose at least 2 in order to check out). If you’d like more than 4 recipes in a week you can order a second, or even a third box, for later in the week. Gousto don’t use halal meat in their recipes at the moment, but they still have a great selection of fish, seafood and vegetarian recipes to choose from each week. Gousto delivers all the ingredients needed to cook delicious, healthy recipes each week. Log on and choose your recipes, they will then deliver pre-portioned ingredients in food boxes to your door. Snap up one of our fantastic Gousto Promo Codes and get a great discount on your order. With fresh ingredients all measured out so you only get the ingredients you need with step-by-step recipe cards, Gousto takes the guesswork out of trying new dishes, simply cook, serve and enjoy your culinary creations.